At a young age, he began to keep a diary–it was about the size of the palm of your hand, and his handwriting so small you need a magnifying glass to read it–with the idea that by reckoning day-by-day his moral assets and liabilities, he could improve himself: “Oh! that I could wear out of my mind every mean and base affectation, conquer my natural pride and conceit,” he wrote. His natural pride and conceit would be among the things his critics would throw at him for the rest of his life. What’s so interesting here is that he recognized this himself so early. I am resolved to rise with the sun and to study Scriptures on Thursday, Friday, Saturday, and Sunday mornings, and to study some Latin author the other three mornings. Noons and nights I intend to read English authors . . . . I will rouse up my mind and fix my attention. I will stand collected within myself and think upon what I read and what I see. I will strive with all my soul to be something more than persons who have had less advantages than myself. are much inferior to the provision, the wonderful provision, that He has made for the gratification of our nobler powers of intelligence and reason. He has given us reason to find out the truth, and the real design and true end of our existence. 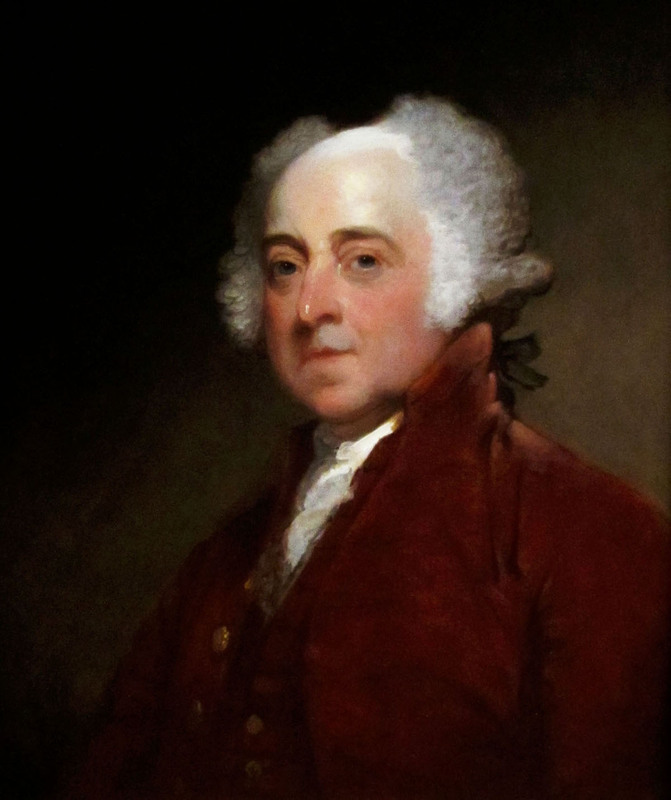 Adams quickly rose in his profession and took an interest in politics. By the time he became president in 1796, he had served a multitude of duties for his country. He had been one of those who explained the philosophy and principles of the American Revolution to the people of the time through what he wrote in newspapers. He had defended the hated British soldiers who were arrested and put on trial after the so-called Boston Massacre, when nobody else would defend them. Asked to do so, and knowing that it might destroy his political career, he thought it his duty in a society governed by law. And it didn’t hurt his career one bit because people saw that he was a man of conviction. He had served brilliantly in the Continental Congress. Among other accomplishments, he was the man who put the name of George Washington in nomination to become the commander-in-chief of the Continental Army; he chose Thomas Jefferson to write the Declaration of Independence; later on he would put John Marshall on the Supreme Court. If he had done nothing but these three things, he would be someone we should know. Adams more than anyone got the Continental Congress to vote for the Declaration. We have no records of what he said. Deliberations took place behind closed doors, out of fear of spies in Philadelphia. Keep in mind that only about a third of the country supported the Revolution. Another third was opposed–the Loyalists or Tories, who saw themselves as the true patriots because they were standing by their King. The remaining third, in the human way, were waiting to see who won. But Adams got the Congress to vote for the Declaration and many wrote about it afterwards. If you’ve seen the musical 1776, you’ll remember that he is the central character. That’s as it should be. And there are many people in it singing, “Why don’t you be quiet, John Adams?” or “Why are you so obnoxious, John Adams?” When I was working on my biography, I tried to find out who called him obnoxious, and I found only one—Adams himself. He wrote to a friend many years later that he must have been rather obnoxious back then, but that he felt he had to make it happen. Adams never failed to answer the call of his country to serve, and he was called upon again and again, always to the detriment of his livelihood and often with risk to his life. He was asked to go to France during the Revolution, and set sail with his 10-year-old son, John Quincy, in the dead of winter. British cruisers were lying off the coast of Massachusetts, just waiting for someone like Adams to make a run for it to try to obtain French war support. Had he been captured, he would have been taken to England, to the Tower of London, and hanged. Keep in mind that everybody who signed the Declaration was putting his head in a noose. When our Founders pledged their lives, their fortunes and their sacred honor, that wasn’t just rhetoric. Keep in mind, too, that they were up against the greatest military power on earth and had very little military experience. They had no money—there wasn’t a bank in all of America in 1776. And no colonial people had ever successfully revolted against the mother country. Everything was against them. Adams and his son took a boat out to the frigate Boston on February 13, 1777, from a place called Houghs Neck, near Braintree. I went with my own son to that point on February 13 at about the same time, just at dusk. It was about 28 degrees, whereas I think it was 24 or 25 degrees in 1777. We got out of a nice warm car to walk down to the shore wearing good down coats and we stood there with those big, green rollers coming in and the clouds looking very ominous and the wind blowing, and we were freezing. We thought to ourselves, how in the world did they have the courage to do it? Adams had never set foot on a ship before. The crossing would take weeks, perhaps months, if they made it. And as it turned out, everything that could have gone wrong went wrong. They were hit by a hurricane. They encountered an enemy ship and fought a battle. They were becalmed for a long period. But they eventually made it. Adams served in France for about a year, then was called home. Wisdom and knowledge, as well as virtue, diffused generally among the body of the people being necessary for the preservation of their rights and liberties; and as these depend on spreading the opportunities and advantages of education in various parts of the country, and among the different orders of the people, it shall be the duty of legislators and magistrates in all future periods of this commonwealth to cherish the interests of literature and the sciences . . . . Many people today are saying that we should be teaching morals in our schools. They could find support in the closing line of this section of the Commonwealth Constitution, which speaks of the necessity “to countenance and inculcate the principles of humanity and general benevolence, public and private charity, industry and frugality, honesty and punctuality in their dealings, sincerity, good humor, and all social affections, and generous sentiments among the people.” Again, if Adams had done nothing but write this remarkable document, he would be someone whose character would deserve our attention. And no sooner had he finished it than he was called upon again to go to France. Let me say a word about Abigail Adams. She probably had better political sense than her husband, and was a better judge of people. And she loved politics. There is a wonderful scene in the White House after Adams had been defeated for re-election by Jefferson. Jefferson was invited to come over and have dinner, as were many members of the Senate and the House. He sat at the table beside Abigail, asking “Who’s that man over there?” and “Who’s this one over here?” And she told him everything about them–where they came from, what their constituency was, what their interests were. She was as bright as can be and had a backbone of iron. She probably didn’t weigh 100 pounds, standing only about five feet one. I think she’s one of the greatest Americans of all time. And you can discover her, too, in her marvelous correspondence with her husband during his long absences. Something I always like to emphasize is that there never was a simpler past. We hear often, “Oh, that was a simpler time,” but it’s always wrong. Imagine Abigail’s life. Up in the morning at about 5 to light the fireplace that served as the kitchen, call to the children to come down, cook the breakfast, tend the stock, try to keep the farm solvent during the whole war with her husband gone and with inflation and with shortages of everything. Schools were closed, so she had to educate the children at home. Her day didn’t end until 9 or 10 at night when the children would go upstairs to their bedrooms, where it could be so cold that the water in the bowls that they used to wash their faces was iced over. And then she would sit down at the kitchen table with a single candle and write some of the greatest letters ever written by any American. In one plaintive letter, she writes: “Posterity who are to reap the blessings will scarcely be able to conceive the hardships and sufferings of their ancestors.” And we don’t. We don’t know what they went through–epidemics of smallpox or dysentery, which could take the lives of hundreds of people just in the little town of Quincy, Massachusetts. It was by no means a simpler time. They had to worry about things that we don’t even think about any more, and suffer discomforts and inconveniences of a kind that we never even imagine. We have little idea of how tough they were. Imagine John Adams setting off in the middle of winter to ride nearly 400 miles on horseback to get to Congress. Try riding even 40 miles sometime. John and Abigail were separated, in all, more than ten years because of his service to the country. Much is written about Adams’ vice presidency under Washington, and about his presidency. But his diplomatic duties were as important as anything else he did. Primarily, he got the Dutch to give us massive loans, which really saved our Revolution–we would probably have lost the war with England had it not been for Holland. He went to the Netherlands on his own, knowing nobody. He didn’t speak Dutch. He didn’t have authorization from Congress because he was out of touch with Congress. But he succeeded. He once said that if anything were written on his tombstone, it should be that he was the man who got the Dutch to provide the loans to win the war. Yet this fact is little known or understood by most Americans. Later on, Adams would say the same thing about being the president who kept us out of war with France. His presidency is often associated with the war frenzy that led to the Alien and Sedition Acts, which Adams signed and which would always stand, appropriately, as a black mark against him. Adams was not a great president. But he was a very good one and I think he should be judged as more presidents should be judged–not just by what he did, but what he didn’t do. He didn’t go to war with France. Had he done so, he would have been re-elected, and he knew it. As it was, the 1800 election was extremely close. A change in about 300 votes in New York City would have re-elected him. And let us not forget that one of the most important turning points in our country, even in the world, was that election, because there was a peaceful transition, following a bitter election, from one party to another. It was not contested by armed opposition, which was the historical norm. Adams went home to Quincy–having traveled more in the service of his country than any other American of that time–and never went anywhere ever again, although he lived for 25 more years. Writing a biography and realizing that your subject is going to stay at home his final 25 years, you wonder how you are going to sustain the rest of the book. But there are all kinds of surprises in life, and to me the great surprise of the last part of Adams’ life is that in many ways it’s the most interesting. It’s at this point that the inward journey begins. He suffers a he has never suffered before. He loses not only Abigail, but their beloved daughter of the same name. Those who say that people then lived in a simpler time should imagine their daughter having a mastectomy in a bedroom of their house with no anesthetic. Adams lost his wife and daughter, he lost a son to alcoholism, he lost his teeth and hair, he lost friends, he lost all of his power, his prestige, his influence. But he kept going. In fact, curiously, having in many ways been seen as a pessimist, he became increasingly an optimist. It’s in this last part of his life especially that you feel his real fiber. I never delighted much in contemplating commas and colons, or in spelling or measuring syllables; but now? if I attempt to look at these little objects, I find my imagination, in spite of all my exertions, roaming in the Milky Way, among the nebulae, those mighty orbs, and stupendous orbits of suns, planets, satellites, and comets, which compose the incomprehensible universe; and if I do not sink into nothing in my own estimation, I feel an irresistible impulse to fall on my knees, in adoration of the power that moves, the wisdom that directs, the benevolence that sanctifies this wonderful whole. A rain had fallen from some warmer region in the skies when the cold here below was intense to an extreme. Every drop was frozen wherever it fell in the trees, and clung to the limbs and sprigs as if it had been fastened by hooks of steel. The earth was never more universally covered with snow, and the rain had frozen upon a crust on the surface which shone with the brightness of burnished silver. The icicles on every sprig glowed in all the luster of diamonds. Every tree was a chandelier of cut glass. I have seen a queen of France with 18 millions of livres of diamonds upon her person and I declare that all the charms of her face and figure added to all the glitter of her jewels did not make an impression on me equal to that presented by every shrub. The whole world was glittering with precious stones. Adams died, as many of you know, the same day Jefferson died. Jefferson had been his closest friend, then his political rival, then his political enemy. After twelve years of neither speaking to each other, Adams initiated the first letter of what was to be one of the great reconciliations in our history. The correspondence between these former presidents lasted until their deaths, and is some of the most wonderful letters in the English language. And then they died on the same day, each in his own bed, surrounded by his books. And it wasn’t just any day. It was the 4th of July, 50 years after the Declaration of Independence. People at the time saw it as the clearest sign imaginable that the hand of God was involved with the destiny of the United States and who could blame them? The fire for some time threatened the most destructive effects–but through the exertions of the citizens, animated by the example of the President of the United States (who on this occasion fell into the ranks and aided in passing the buckets), was the fire at length subdued. Adams said once, “I am but an ordinary man. The times alone have destined me to fame.” But don’t believe that for a minute. Certainly they were the most interesting times imaginable. But he was an extraordinary man. His faith in God and the hereafter remained unshaken. He was as devout a Christian as ever served in our highest office. His fundamental creed he had reduced to a single sentence: “He who loves the Workman and his work and does what he can to preserve and improve it, shall be accepted of Him.” His confidence in the future of his country was, in the final years of his life, greater than ever. Human nature had not changed, however, for all the improvements his generation had brought about. Nor would it, he was sure. Nor did he love life any less for its pain and uncertainties. Once, in a letter to his old friend Francis van der Kemp in the Netherlands, he’d written: “Griefs upon griefs! Disappointments upon disappointments. What then? This is a gay, merry old world, notwithstanding.” It could have been his epitaph. David McCullough was born in 1933 in Pittsburgh, Pennsylvania, and was educated there and at Yale University. Author of 1776, John Adams, Truman, Brave Companions, The Path Between the Seas, Mornings on Horseback, The Great Bridge and The Johnstown Flood, he has twice received the Pulitzer Prize and twice the National Book Award, as well as the Francis Parkman Prize and the Los Angeles Times Book Award.